The Australian Securities and Investments Commission has a plan to recoup the $120 million dollars that was cut from its funding in the federal budget. It wants to charge financial planners higher registration fees. 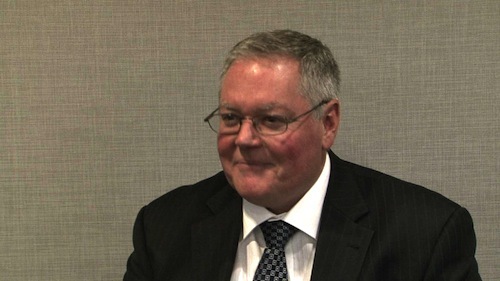 ASIC’s Chairman, Greg Medcraft, says another benefit of this ‘user-pays’ funding model is that it will help to weed out dodgy operators from the industry. With a 12 per cent cut in operating budget, the ASIC will have to cut back on monitoring of companies, advisors and markets and will have to rely more on tips offs rather than taking proactive action. Read the full story. Despite a rise in GDP to a better-than-expected 1.1% rise (pushing the annual rate up to 3.5%) the Australian share market closed lower on Wednesday. This mirrors the situation in most major markets, including the UK, Europe and much of Asia, as investors wait to see what the European Central Bank will say after its meeting tomorrow. Concerns over the Eurozone’s stability have been cited by analysts as a major reason for markets to be dull this week. Read the full story. The US and Japan markets saw slight rises on Wednesday but the overall picture is for very little excitement globally with both the ECB meeting on Thursday and the release of US employment data on Friday. Experts predict it could be early next week, when all the information has been announced and digested, before we see any real vitality in trading. Read the full story. The latest figures from the Australian Bureau of Statistics will be the topic of conversation in many workplaces this morning, as they reveal that when inflation is factored in, median wages (from 2012 to August 2013) had fallen by 2% to $950 a week. Add to that an increase in casual workers, who are not entitled to holidays, sick leave or carer leave. Around 25% of the workforce are ‘casual’ and miss out on these paid leave entitlements. Read the full story. The Federal Reserve published its ‘Beige Book’ report on its 12 districts on Wednesday and it shows that the US economy grew in the last six weeks in all of those regions. The last Beige Book saw growth in 10 of the 12. With bad weather cited as a major factor in poor business in the first quarter of the year there is still a chance of a ‘snap back’ for the economy, but in any case the report, which is considered as part of the Fed’s interest rate decisions, largely shows positive signs in many industries. Read the full story. The CEO of Rio Tinto says he thinks Goldman Sachs’ prediction of iron ore falling to USD$80 a tonne was overly pessimistic. Speaking on TV in London, Sam Walsh said he thinks USD$100 is a more likely bottom line, but that in any event Rio Tinto is well placed to ride the storm. The iron ore price has fallen 30% so far this year, but Mr Walsh appears confident that this decline may be nearer its conclusion. Read the full story.